The last week or so has been one of contrasts. We had a wonderful day on Nisiros, leaving Lynn Rival in the little harbour of Palli and exploring the island by scooter (not our favourite form of transport but ok in the circumstances). 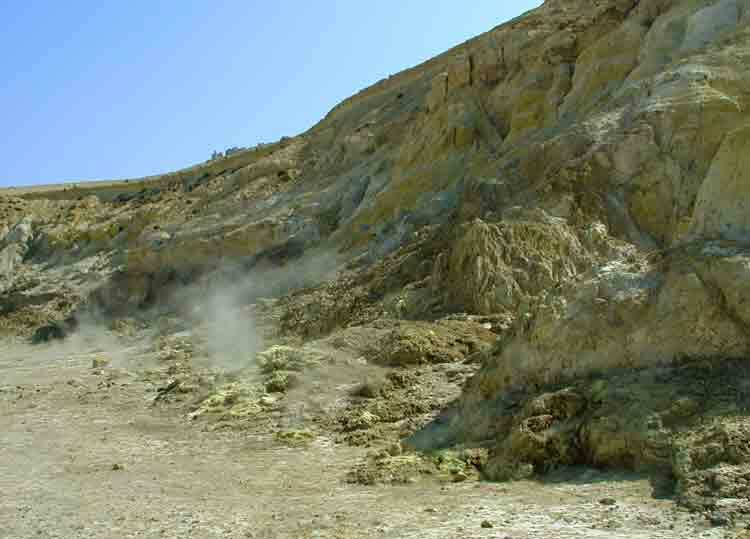 The island is not much more than a big volcano, with spectacular scenery on both the outside and inside the caldera. 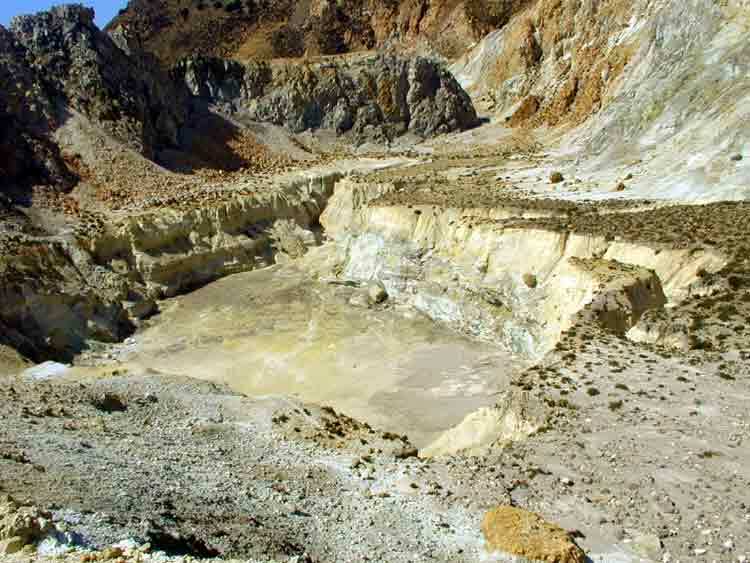 The main crater stinks of sulphurous fumes, and has steam emerging from crumbly brown fissures lined with bright yellow crystals. 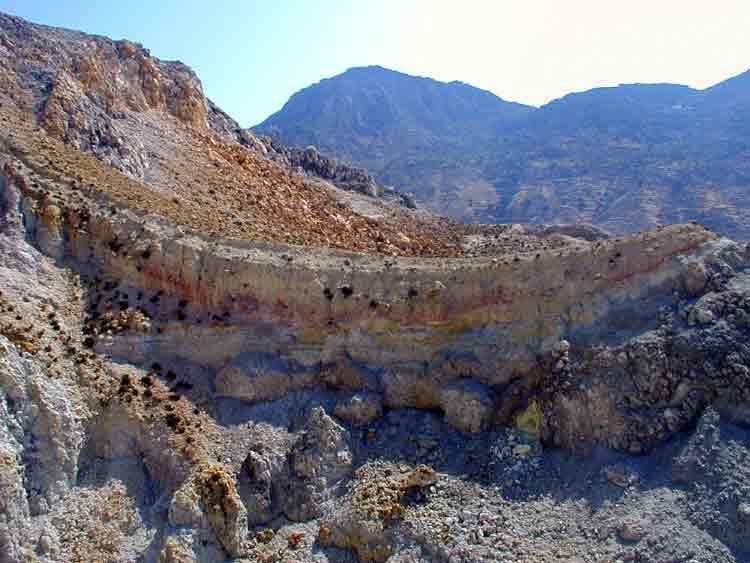 The smaller craters are similarly smelly and steaming, and the surrounding rocks striped with pinks and yellows. The harbour at Palli. Note island in background being quarried for pumice. The wind was quite strong and although the shelter was good in Palli, there was quite a swell rocking the boat so we were glad to leave on Tuesday morning. The wind was Force 5 with enough west in it and the waves were not very big so we didn't have to work too hard to sail the 13 miles north to Kardhamena on Kos island. 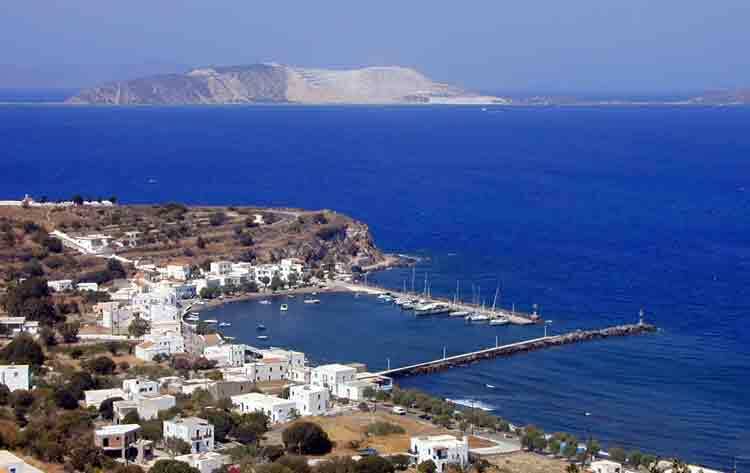 Kardhamena has a good harbour for shelter and is conveniently close to Kos airport (for meeting Gavin), but it is a major tourist resort so you have to put up with loud music blaring from the bars until after midnight. Gavin arrived at noon on Wednesday and spent another night in Kardhamena, before setting off west to Kamares on Thursday. Despite the overwhelming influence of package tourism we did appreciate the good shopping facilities and enjoyed genuine bacon butties for breakfast. Greek bacon doesn't compare with the English variety (which are specially imported in such places as Kardhamena). We had been to Kamares (on the south west end of Kos) before Nisiros, and once again we were impressed by the good shelter at anchor there, as well as the lack of late-night music bars to keep us awake. We were also impressed by how friendly everyone was on Kos (compared to say Skiathos) but maybe the time of year has something to do with it. Our sail to Kamares had been fast in Force 4 to 5 and the weather forecast for the next few days was for the same winds so we decided to see if we could head north, taking advantage of the tendency for the wind to be in the northwest. On Friday we set out early, around the southwest end of Kos and made our way up to Kalimnos island. At times the wind was Force 6 so we were down to 2 reefs in the main and a much reduced genoa but the seas were not too bad and we reached the well-sheltered bay at Emborios on the NW coast of Kalimnos by late afternoon. The bay there is deep and the bottom covered in thick weed so we were happy to pick up a mooring laid by one of the enterprising taverna owners onshore. The only problem was that when the wind dropped at night, the boat kept knocking on the large mooring buoy, waking us up from time to time. On Saturday we had another prompt start and again headed north, outside of Leros island, towards Agathonisi. We had F5-6 again but enough west in the wind to sail the 28 miles there on one tack. Arriving in the late afternoon we found the anchorages quite full but managed to squeeze ourselves in not far from the harbour. We went ashore for supper and enjoyed sampling the delicious goat stew which these northern Dodecanese islands specialise in. The forecast for Sunday was F4, occasionally 5, so we anticipated a gentle Sunday sail, west to the island of Arki. It turned out to be a bit stormy, gusting F6 at times so we had to work harder than anticipated, but got to Arki in time for late lunchtime beers ashore. We moored up at the quay in Port Augusta, another well-sheltered spot, and enjoyed a peaceful night on this lovely little island. We ate goat stew again for supper. The locals were eating raw sea urchins but we were not offered any and didn't ask! The forecast for the next few days is for light winds and possible thunderstorms. Today we left Arki and had to motor all the way to Patmos, about 10 miles to the west of Arki, as there was little wind. We're now moored up to the quay in Patmos and it feels hot and sticky.